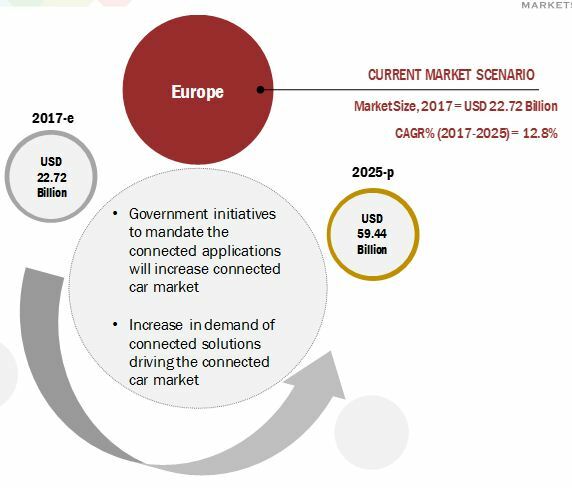 [174 Pages] The connected car market is valued at USD 52.62 Billion in 2016 and is projected to reach USD 219.21 Billion by 2025, at a compound annual growth rate (CAGR) of 14.8% during the forecast period. In this study, 2016 has been considered as the base year, and 2017–2025 the forecast period, for estimating the size of the connected car market. 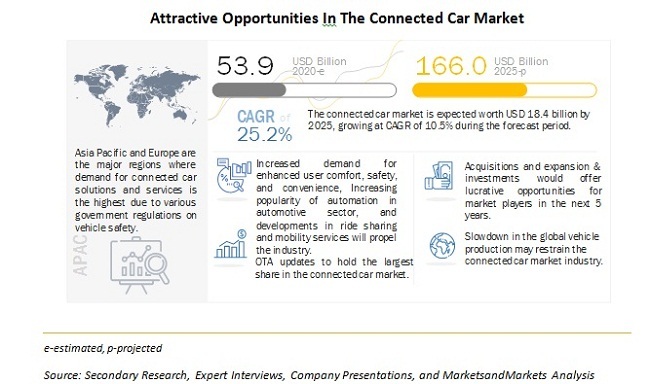 The report analyzes and forecasts the market size value (USD million) of the connected car market. The report segments the connected car market and forecasts its size by service, network, transponder, form, hardware, end market, and region. The report also provides a detailed analysis of various forces acting on the market, including drivers, restraints, opportunities, and challenges. It strategically profiles key players and comprehensively analyzes their market shares and core competencies. It also tracks and analyzes the competitive developments, such as joint ventures, mergers and acquisitions, new product launches, expansions, and other activities carried out by key industry participants. The research methodology used in the report involves various secondary sources, such as National Highway Traffic Safety Administration (NHTSA), GENIVI Alliance, Japan Automobile Manufacturers Association (JAMA), European Automobile Manufacturers Association (EAMA), Canadian Automobile Association (CAA), and Korea Automobile Manufacturers Association (KAMA). Experts from related industries and connected car devices vendors and service providers have been interviewed to understand the future trends of the connected car market. The market size of the individual segments was determined through various secondary sources: industry associations; white papers; and journals. The vendor offerings were also taken into consideration to determine the market segmentation. The top-down and bottom-up approaches have been used to estimate and validate the size of the global connected car market. The data triangulation and market breakdown procedures were employed to complete the overall market engineering process and arrive at the exact statistics for all the segments and subsegments. The ecosystem of the connected car market consists of manufacturers, such as Continental (Germany), Delphi (UK), Bosch (Germany), Denso (Japan), and Harman (US), and research institutes such as JAMA, EAMA, CAA, and KAMA. The connected services are majorly influenced by end-user’s demands. The services such as navigation, multimedia streaming, social media & apps, and remote diagnostics are expected to increase the convenience of the driver. The safety & security services are the key concern for government regulatory. Hence it is creating a new ecosystem for automotive and non-automotive players to leverage the revenue. Major OEMs have started implementing autonomous services to improve the comfort in the vehicle. The connected car market is driven by the demand for connected services. In countries, such as the US, Germany, Japan, and China, connected services are getting standardized from OEMs’ end, and hence the market for connected services is increasing at a significant growth rate. How revenue would be leveraged from data of connected car in its value chain? How connected car services pricing model will be established among automotive and non-automotive players? The government of respective countries are mandating the key connected features into the vehicle, and hence making industry more competitive. Then, what will be the distinctive services that needs to be developed by connected car service providers? The global connected car market, by value, is estimated to be USD 72.89 Billion in 2017 and is projected to reach USD 219.21 Billion by 2025, at a compound annual growth rate (CAGR) of 14.8% from 2017 to 2025. Some of the major drivers identified are increase in industry compliance norms and government mandates supporting connected technology in passenger cars. However, factors such as network coverage limitation, lag in lack of standardization, and concerns related to data privacy and cybersecurity may hinder the growth of the connected car market in the future. 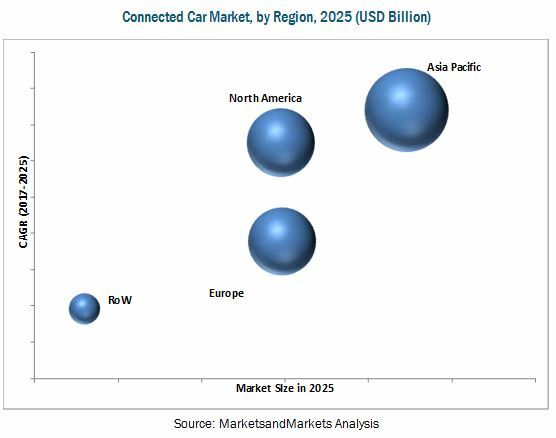 The global connected car market is segmented by network, service, transponder, form, end market, hardware, and region. The report discusses various types of features, such as navigation, remote diagnostics, multimedia streaming, on-road assistance, eCall, and auto parking. The connected services segment is expected to account for the largest market share in the global connected car market, which would grow at a significant CAGR during the forecast period. The growth of connected car services is expected to be driven by an increase in demand for convenient features and increase in government mandates. Furthermore, to understand the type of end market, the report discusses the market for connected car under 2 distinctive end market types, namely, Original Equipment Manufacturer (OEM) and aftermarket. To understand the market in different forms, the connected car market is segmented into embedded, tethered, and integrated; by hardware into smart antenna, display, Electronic Control Unit (ECU), and sensors; by transponder into roadside unit and on-board unit; and by network into Dedicated Short-Range Communication (DSRC) and cellular. The extensive study has been done on 4 key regions, namely, Asia Pacific, Europe, North America, and the Rest of the World (RoW). Asia Pacific is expected to account for the largest market share, followed by Europe, North America, and RoW. Asia Pacific is anticipated to remain predominant during the forecast period due to various factors, such as increasing connected car devices in passenger cars, and increase in digital services such as cybersecurity and updates. In terms of growth rate, North America is projected to exhibit the second highest CAGR during the forecast period. The growth in North America is anticipated to be driven by increasing government mandates and growing communication and information technology infrastructure, such as 4G LTE or 5G. Some of the major restraints identified in the global connected car market are lack of supporting infrastructure in developing countries and unavailability of standard platforms. As of 2017, there is a significant increase in cybersecurity threats for smart vehicles. This factor may pose a challenge for the growth of the connected car market to some extent. Some of the major players in the global connected car market are Bosch (Germany), Continental (Germany), Harman (US), Denso (Japan), ZF (Germany), NXP (Netherlands), Infineon (Germany), Valeo (France), and Delphi (UK). The last chapter of this report covers a comprehensive study of the key vendors operating in the connected car market. The evaluation of market players is done by taking various factors into account, such as new product development, R&D expenditure, business strategies, product revenue, and organic and inorganic growth. Drivers and passengers are increasingly expecting the access to connected services in their vehicles. These connected services are shaping the sales of new vehicles with a significant revenue stream. Currently, end-users want convenient driving experience in their road journey. These new connected technologies are making competitive challenges for OEMs as other non-automotive players of various industries are entering the automotive space. The features which have been considered under the connected services are named as navigation, remote diagnostics, multimedia streaming, social media & other mobile apps, and OTA updates. The connected car features various functions for the safety of the driver and passenger, such as eCall & SOS assistance, on-road assistance, and collision warning. For data privacy, the features such as cybersecurity and remote operation, have been offered. The safety & security services market is driven by the government initiatives to reduce the number of road accidents and increase the safety of drivers and passengers. For an instance, the European transportation authority has mandated the eCall; every new car should have eCall capability for emergency situations. In the recent years, a few companies have tested automated driving using onboard sensors and high-resolution digital maps (V2N). However, the industry experts believe that 5G-based V2V and V2I would allow better adaptation of moving vehicles in accordance with the nearby traffic and offer higher customer satisfaction. Advanced control systems in these cars interpret the sensory information to identify appropriate navigation paths, obstacles, and relevant signage. Connected car is the stepping stone to autonomous technology. How much time this technology will influence the market of autonomous vehicles? How OEMs will able to overcome the challenge due to emergence of aftermarket in connected car? Will government, automotive and non-automotive players implement any strategy mutually to make the robust infrastructure for connected car in developing countries? Figure 15 Embedded Form is Estimated to Lead the Market, During the Forecast Period. Figure 16 On-Board Unit is Estimated to Lead the Market, During the Forecast Period. Figure 17 Connected Services is Estimated to Lead the Market, During the Forecast Period. Figure 19 ECU is Estimated to Lead the Connected Car Market, During the Forecast Period.